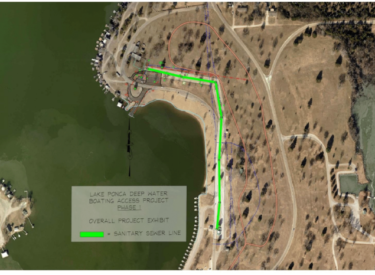 City Commissioners approved a $171,055.08 contract with Sober Brothers Monday night for the extension of a sanitary sewer on Checkstand Road at Lake Ponca. The sewer is the first of several steps in the deep water ramp project that has been discussed and planned over many years by the Park and Recreation Advisory Board. Plans are now moving forward with grants in the works to help with funding the project. The ramp would ease the struggle boaters have with entering the lake when water levels are low in hot summer months. This piece of the project is for the construction of 1,736 linear feet of 10-inch sanitary sewer line as part of the improvements. Other Phase 1 elements include construction of a new asphalt parking lot to provide 10 boat trailer parking stalls and the construction of a new restroom facility adjacent to the boat trailer parking lot. The project is being funded 75 percent by a grant from the Oklahoma Department of Wildlife Conservation with the City’s share being 25 percent. The sewer portion of the project was advertised for bids on July 25, with a mandatory pre-bid meeting being held on Aug. 7. Bids for this project were opened on Aug. 15. Four bids were opened and read, with Sober Brothers submitting the winning bid.